V11 Sport, Le Mans, Rosso Mandello, Scura, Tenni, Cafe Sport, Rosso Corsa, Nero Corsa, Naked Ballabio, and Coppa Italia. If you suspect the valves need adjusting, do that first. Disconnect the synchronization rod at the ball joint on the right side (the side with the TPS sensor), back off the right throttle idle screw using a 2.5mm hex key, and back off the "choke" cam (make sure the choke cable permits full retraction of the cam (it didn't on my bike). Turn on the ignition key, but do not start the bike. Measure the voltage difference between the two outer wires of the TPS. If the voltage is not 150 mV ±5 mV, then loosen the TPS clamp screws and gently rotate it as required. Be careful not to force it against the TPS’s internal stop in the direction of reducing the voltage, which could damage it. Plus or minus 5 mV can be obtained with a little effort. To do the next step, you will need to connect a vacuum manometer (e.g. mercury stick) to each of the two ports on the intake fittings next to the cylinder head. These are normally connected together with a hose, which is to be temporarily disconnected. Next, close both air bypass screws, reconnect the synchronization rod, but keep the right throttle idle screw backed off to put the connecting rod in tension, removing any backlash. 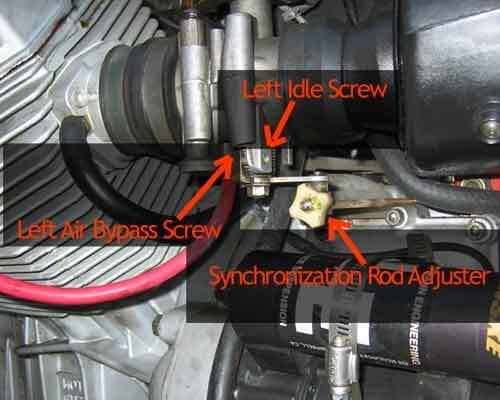 Start the engine and balance the throttle body vacuums at idle using the synchronization rod adjustment. Screw in the left throttle idle screw if the idle is too low to maintain. Do not use the choke for this purpose, because that would put the connecting rod in compression, introducing backlash, causing the throttle bodies to go out of balance. Now adjust the left idle screw for a TPS reading of .521 volts. + - .005 (corresponding to 3.5 degrees physical opening, as read by the optional diagnostic software). This accuracy can be obtained with a little effort. 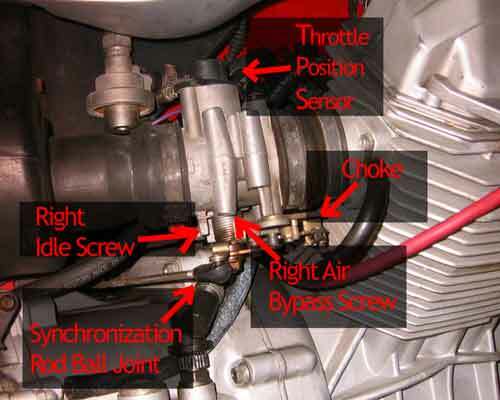 (Some riders have been known to also subsequently physically readjust the TPS (not the idle screw) to lean or richen the entire throttle range. However, loosening its screws and offsetting the TPS to a higher voltage, e.g. .539, will fool the ECU into adding more fuel, but it will also fool the ignition timing table. See also the note at the bottom under Options. Next open both air bypass screws to obtain the idle RPM at 1100 to 1200 while maintaining balance. Air bypass screws should be open 1/2 turn or more. If not, back off the idle screw to reduce the TPS voltage reading in steps of 15 mv and open the air bypass screws to compensate until they are opened 1/2 turn or more. B. Check balance at idle RPM. If OK, go to step C, if not, rebalance at idle using the air bypass screws, and go back to step A.
C. Disconnect the voltmeter and manometers. Replace the hose connecting the two intakes. Once this procedure is completed successfully, future minor changes in idle speed can be made simply by adjusting the left throttle idle screw. Since the throttle bodies have been balanced, backlash between them has been eliminated, and air bypass screws have been properly adjusted to maintain balance at idle, these should be stable for many miles. Use a gas analyzer if available to set the CO level. Use a diagnostic tool or diagnostic software such as Axeone or TechnoResearch's VDSTS to adjust the fuel trim, check throttle angle, RPM, and more. Left and Right side pictures. Contributors of useful technical information: docc, BrianG, Guzzijack, luhbo, motoguzznix, pete roper, Greg Field, Jeff in Ohio, and MPH motorcycles.